The coaching will be specific to the Individual and the skills worked on will be dictated by you. What do you want to Improve? Do you want to move around the river with less effort? Do you want to learn to surf? Do you want to get better in your little/play boat? Do you want to start looking at boofing? Are we thinking about some tricks/freestyle on the river? Getting better at rescues? More rope work? Safer swimming? There is no limit to what we can work on in this course. As well as general improvement we will take a more in-depth look at Whitewater safety and rescue skills, strong decision making, and safe swimming. Kayaking season has arrived once more! What better way to ease back into it than with the comfort of a professional coach to help you dust off the cobwebs and awake the Whitewater muscles from hibernation. Are you a Beginner kayaker? Have you never tried yet always fancied it? Do you have a lust for adventure that can be suppressed no longer? The zero to hero program is a four-week program designed to get you from having never sat in a boat; to sending it down Whitewater rapids with style. 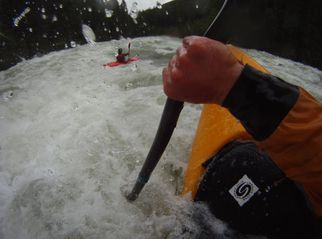 Over four days/sessions you will learn all the necessary skills to enter the world of Whitewater paddle sports. This will include equipment, weather, water levels, basic paddling technique, decision making, navigating obstacles and rapids, and ultimately having the best times making great friends in some of the most picturesque landscapes on the planet.